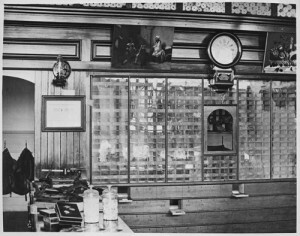 Even in 1876, Fargo’s first post office, although small, was well-fitted to serve the citizens, conveniently located next to the bank, and marked another step towards Fargo becoming a city unto itself. By 1883, the town had grown enough that The Fargo City Council resolved to begin mail delivery in Fargo. Seven years later, they began petitioning Representative Hansbrough and Senator Pierce to fund a $250,000 public post office building. All along the way, however, the location and access to Fargo’s post office remained vital to the city’s communication and interstate business transactions outside the territories, and ultimately the new building had a functionality underscored only by its impressive organizational features.